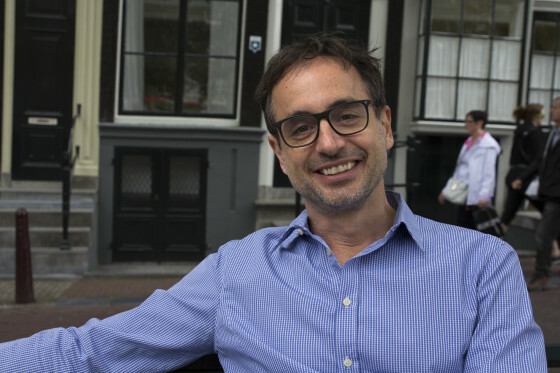 Andrew Moskos (47) came to Amsterdam on a whim 23 years ago to bring English-language comedy to the city. His club, Boom Chicago, is now an institution on the Dutch comedy scene. Although comedy is his business, Andrew is deadly serious about quality strawberries and Dutch tram design. After university, my best friend and I were tourists in Amsterdam and we fell in love with the city and wanted to move here. We thought there was a gap in the market for this sort of comedy, so we wrote to the city and said ‘here’s our idea, what do you think?’ They wrote back and said ‘your idea will not work, you won’t get any subsidy, think twice about it.’ We took that fax, framed it, and decided to come anyway. I’m happy we didn’t take their advice. I’d say expat. I have no problem with the term ‘tourist’ mind you. It has a bad name, but when you go to another city and you don’t live there, you’re a tourist. People say they’re ‘international’ or whatever like it’s somewhat better than a tourist. What’s wrong with being a tourist? Here for the long haul! I’m married, have two kids, and Boom Chicago is going great. I can make a living doing the creative job I want, so I’m never leaving. I do speak Dutch. When I realised I wanted to stay here I wanted to go to see theatre shows myself, read the paper and have Dutch friends. So I learned through a combination of lessons, reading the newspaper, and the desire to just do it. Lambadas – the Dutch hothouse strawberries. You can get them about three months out of the year and they’re fantastic. They’re super expensive but they’re like candy. Soft and flavourful, unlike the hard American strawberries. I’d rather spend €50 on strawberries than gasoline, so I chose strawberries over a car here. Pretty Dutch – I like a slow meal and I can sit on a terrace in any weather. I don’t like the Dutch birthday circle – that’s a bit silly – and I don’t like drop, so unfortunately I’m not that Dutch yet. I refuse to take an inburgeringscursus, as we pay so much tax here, I speak Dutch, and we hire people. I don’t see my friends enough as it is, so I’m not going to waste my time with an inburgeringscursus. I’m sorry, arrest me! I don’t know the names of these people, but there’s two people I’d be excited to meet and one guy who needs to be scolded. The bad guy is the person who made the decision to buy those Combino trams and put a conductor in the back of them. The fact that everybody has to filter past that spot, and it’s about 40cm wide, is just bad design. Rotterdam did it right, no conductor booth and a conductor walking around the tram. They’ve got the best trams and the best conductor system. I want to meet the guy who designed the new Amsterdam street lamps. They’ve got a fluorescent ring in them, they’re very old but very modern and they light the area wonderfully. The last good guy is the guy who invented the new traffic plan in front of central station. They’re taking the cars away so you can go all the way from central station to Dam square without crossing a street, and that is such an imaginative, innovative idea. The grachtenhuis (canal house museum) has a nice history of the canals. You’re in and out in about 30 minutes, it’s high tech, and done in different languages. It’s in an old canal house, and this was the centre of the financial world back in the golden era. The bankers that loaned America money back in the 1700s lived in a house like this, so it’s full of history. Amsterdam and the Netherlands is pinball country! If you go to England nobody plays pinball any more, but there’s still a lot of places in Amsterdam where you can play good pinball machines. For 800,000 people, there’s a high ratio of pinball machines to people here. I’d just go biking on a warm day. Because we’re in a country where the weather is not our strongest suit, everybody changes their plans when it turns nice out. The biking infrastructure of Holland on a warm, sunny, blue-sky day is still magic. Boom Chicago’s new show, Angry White Men – Trump up the Volume – premiers in Amsterdam this week.